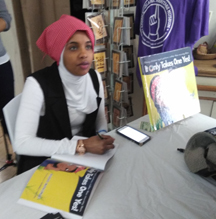 Somalian-American Habso Mohamud, author of "It Only Takes One Yes!," encourages the young to be themselves and to know that life evolves – and in her talks, she reminds adults that a supportive yes can help children be who they are and reach their dreams. Habso Mohamud celebrates September 20 as her birthday, though it may not be the day she was born. Her mother, who was born in Somalia, was in a Kenyan refugee camp during her birth. “I know I was born in 1994, but my mother does not remember the date,” Mohamud said at a book signing at America’s Islamic Heritage Museum in Washington, D.C. The St. Cloud, Minnesota resident now celebrates the day she published her first children’s book “It Only Take One Yes!” as her birthday. She hopes her easy-to-read, delightful story will show children that their lives, like hers, can evolve. “I wish I could teach in the jungle. We would all love to read. We would have the best schools, books would grow on trees.” says her character Nasra in the early pages of the book. “Now, I am the queen of the jungle, our books don’t grow on trees. But, we share everything we know,” she writes on the flip end with illustrator Hammed Shittu’s large, colorful, multi-cultural characters. Back in Kenya, Mohamud walked 45 minutes to attend school. She would miss school sometimes because her mother of 10 children could not find a baby sitter while she walked Mohamud and her school-aged siblings to school.